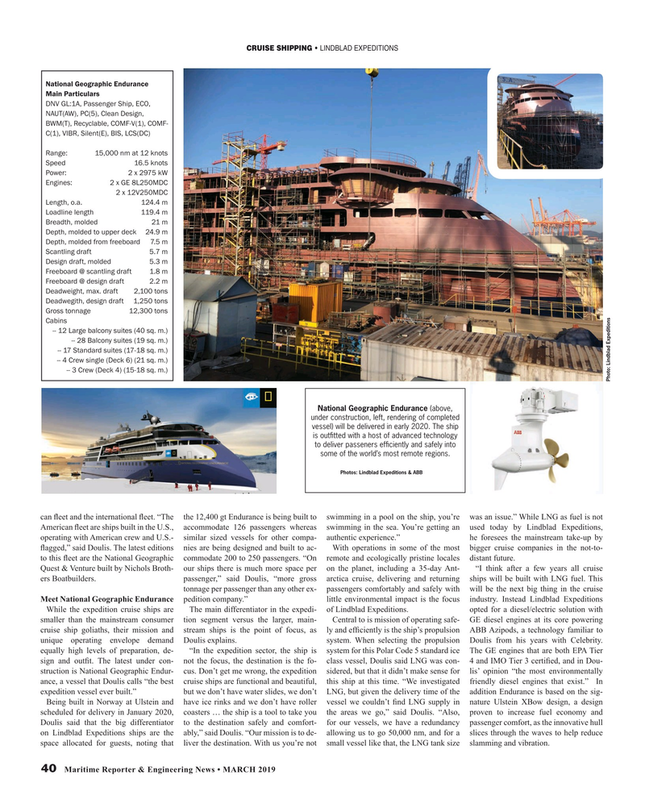 National Geographic Endurance (above, under construction, left, rendering of completed vessel) will be delivered in early 2020. The ship is out? tted with a host of advanced technology to deliver passeners ef? ciently and safely into some of the world’s most remote regions. American ? eet are ships built in the U.S., accommodate 126 passengers whereas swimming in the sea. You’re getting an used today by Lindblad Expeditions, operating with American crew and U.S.- similar sized vessels for other compa- authentic experience.” he foresees the mainstream take-up by ? agged,” said Doulis. The latest editions nies are being designed and built to ac- With operations in some of the most bigger cruise companies in the not-to- to this ? eet are the National Geographic commodate 200 to 250 passengers. “On remote and ecologically pristine locales distant future. Doulis said that the big differentiator to the destination safely and comfort- for our vessels, we have a redundancy passenger comfort, as the innovative hull on Lindblad Expeditions ships are the ably,” said Doulis. “Our mission is to de- allowing us to go 50,000 nm, and for a slices through the waves to help reduce space allocated for guests, noting that liver the destination. With us you’re not small vessel like that, the LNG tank size slamming and vibration.